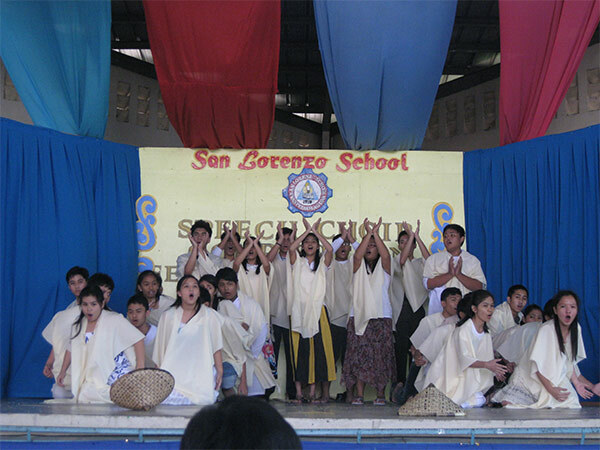 In its aim to facilitate the total formation of individuals, San Lorenzo School provides varied co-curricular and extra-curricular activities to supplement the curricular program. Through these activities the students are able to apply in actual experiences the knowledge, skills, values, and principles learned inside the classroom. They are given opportunities to experience working well with others, develop good workmanship, leadership, and a strong sense of social responsibility. They learn to make use of their talents in the service of God and the community. Students Assembly (SA): This is the highest student Governing Body that acts as a liaison between the student body and the school authority. It serves as the umbrella organization of all clubs and organizations. Student/Pupil Government for Elementary (SPG): A student governing body for elementary that also acts as a liaison between the student and the school authorities. Quizzers Club: Assists the teachers in the tutorial services given to students who need follow-up. Members are trained in preparation with the different academic competitions inside and outside the school. 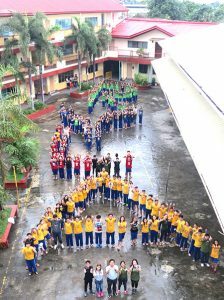 Reflection / Junior Reflection / Aninag: Facilitates the development of the students’ skills in journalism. It takes charge of the school’s official publication. Juventus Christe: A religious club that promotes the Christian spirit of prayer and loving service among the youth. It interprets the basis of faith as total, dynamic, and collective. 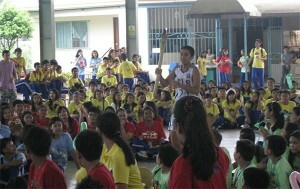 This club also promotes spiritual and moral activities. Glee Club: This Club seeks to develop the potentials and interest of students in singing and music. It also assists in liturgical and other civic services and at the same time contributing to our Filipino cultural life. Drum & Lyre Corps: Facilitates the development of students’ potentials in music. Represents the school in civic parades and other religious activities. 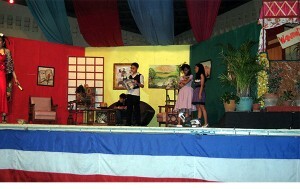 Performing Arts: Develops students’ artistic talents, skills and sensibility in acting, singing, and dancing. It also enhances and uses dance as the medium of expression of a student’s artistry through which cultural aspects of various societies can be gleaned. Cybernetics Club: Supports the thrust of the school in maintaining integrity of creation by promoting care for the earth and its environment. It also seeks to arouse deeper interest in the natural science and science oriented activities. Ekosaysayan: Fosters environmental and historical awareness, and promote activities that would enhance this awareness. Fellowship: A non-catholic group promoting Christian fellowship through praises, prayers, and Christian services. 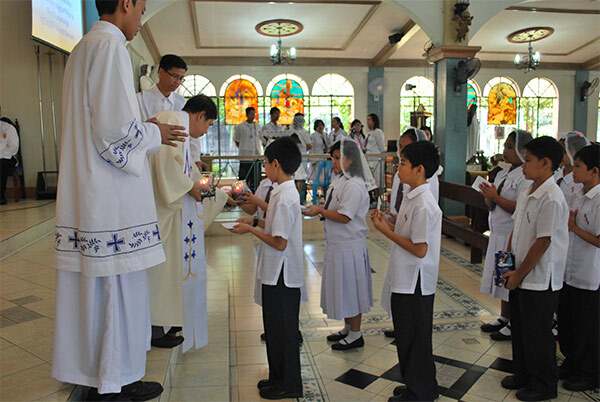 It aims to develop and perpetuate distinctive and enduring values of the true Christian spirit, encouraging common activities and endeavors towards the spiritual, social, physical, and intellectual development of the students. Scouting: An organization for boys and girls that deals with social, physical, mental, and spiritual development through outdoor activities such as camping and advancement. Being a member of the global brotherhood and sisterhood of scouting, one gains the opportunity to learn skills that will assist him/her to be of service to one’s fellowmen and community. Interact Club: Rotary International’s service club for students aged 12-18, sponsored and guided by the Rotary Club of Metro San Pedro, that helps develop leadership skills, promotes Rotary’s principles, exposes members to socio-civic projects, and establishes a network of friendships with local and overseas Interact Clubs. Matrix Club: This club is an extension of the Math subject outside the class. It seeks to arouse interest in Mathematics through different activities and tutorial services for fellow students, and it encourages the students to love and value Math subject. K-Kids Club: This is a Kiwanis International sponsored club for the elementary students that fosters the development of strong moral character, leadership potentials, and provides opportunities for working together in service to school and community. Key Club: This is a Kiwanis International sponsored club for the high school students that promotes the principles of Kiwanis International, fosters leadership development, socio-civic engagement, and provides opportunities for collaboration with local and international Key Clubs. Speakers Bureau: This club develops the oral and speaking skills of the students by promoting different activities in line with elocution. Members are also trained to compete in inter-school competitions. CAT – This organization assists the school in enforcing the rules and policies of the school and helps in maintaining order and discipline. It also assists in maintaining proper decorum in every school activity, and provides community services periodically. Book Lovers Club: This club seeks to promote interest and appreciation to the various aspects of library and library services, and love of good books as well as the spirit of service to under-privileged students studying in public schools. Dramatics: A theater art organization directly involved in the production of stage plays in coordination with the Speech and Drama Class. It aims to promote and develop cultural and literary awareness in the field of acting, directing, playwriting, and stage production. Karatula (Kahusayan at PangaRap Tungo sa Lahing Atin): This organization aims to promote Filipino pride among the students through various programs which would help them value the Filipino race; to serve as a guide in developing the Filipino language and literature, and to inculcate a deep love for one’s country. Techknowledge-E: The club develops the students’ talents and abilities in the proper use of computers, software applications, as well as preventive maintenance. The club provides different activities and competition that would enhance the skills and crafts of the members in terms of computer technology.